The AAEA Fellows Selection Committee has selected six outstanding members to be honored as AAEA Fellows. In this release of The Exchange, we will learn about C. Peter Timmer and how he is shaping the future of the Association and the field of agricultural and applied economics as a whole. C. Peter Timmer is an authority on agricultural develop-ment, food security, and the world rice economy who has published scores of papers and books on these topics. He has served as a professor at Stanford, Cornell, three faculties at Harvard, and the University of California, San Diego, where he was also the dean of the Graduate School of International Relations and Pacific Studies. 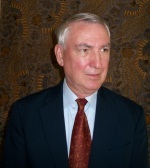 Timmer is now the Cabot Professor of Development Studies, emeritus, at Harvard University. A core advisor on the World Bank’s World Development Report 2008: Agriculture for Development, Timmer is a non-resident fellow at the Center for Global Develop-ment. He was awarded the Leontief Prize in 2012 for advances in economic thought and delivered the 18th Annual UNU-WIDER Lecture at the UN in New York in 2014. Timmer’s research and advisory work focuses on three main themes: lessons from the historical experience of structural transformation in Europe and Asia for the role of agriculture in currently developing countries; the impact of modern food supply chains on smallholder farmers and poor consumers; and approaches to stabilizing rice prices in Asia with minimum spillover to the world market and to producers and consumers in Africa and Latin America. In the next issue of The Exchange, you will learn about another 2015 Fellow with a brief biography of achievements in their career. You can also read about them by searching for our hashtag on Facebook and Twitter: #MeetAAEA2015Fellows. Note: The Exchange is now distributed bi-weekly. The People Section will continue to be bi-monthly and is scheduled to next appear in May 2015. Click here to view the most recent People Section from Issue 6.